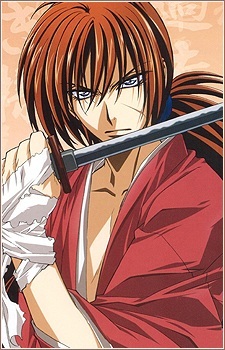 Kenshin Himura, also known throughout the anime as Hitokiri Battousai (Battousai the Manslayer) or Himura the Battousai is the main character of the anime series Rurouni Kenshin. His original name was Shinta (心太). His parents died of cholera when he was very young and as a result, was adopted by three slave women in a traveling slave wagon. Soon after meeting them, bandits had raided the convoy and killed his three new guardians and were about to kill him when a man named Seijuro Hiko killed the bandits. Hiko soon adopted the child and because Shinta was not a name fitted for a swordman, he renamed him Kenshin, meaning "Heart of Sword," took him under his wing and taught him the Hiten Mitsuruugi Ryu. However, before full completion of the sword style could be passed on to Kenshin, the Japanese Revolution had been happening at the time and right before Kenshin's eyes. Because of his kind nature and seeing people suffering, he knew he needed to do something about it. He left in the middle of his training and without his master's blessing and joined the Imperialists. It was during the Revolution where Kenshin met Tomoe, his first love and wife. (See Rurouni Kenshin: Trust and Betrayal OVAs). During the revolution, Kenshin was given the nickname of Hitokiri Battousai because of his god-like speed of drawing a sword to kill the enemy instantly. After helping the Imperialist to a position where they would undoubtedly win the revolution, Kenshin left the revolution all-together with a vow to never kill again and the reverse-blade sword handed to him by Shakku-dono. It was Tomoe's death by his hands that pushed him over the edge of never to kill again. The next time Kenshin is seen is 10 years later as he has become a wanderer who helps out anyone in need who is suffering right before his eyes. Those long 10 years have taken him from Kyoto, all over Japan to where we find him in episode one of the anime, in Tokyo, still keeping his vow never to kill again. It is here where he meets Kaoru Kamiya and his whole life begins to change once again. (See Rurouni Kenshin anime). Kenshin is usually depicted as a care-free swordsman who is very aloof and tends to be a bit simple-minded when it comes to living normally. He is seen to be doing many of the chores around the dojo that he stays at with Kaoru, (i.e., cooking, cleaning, laundry, etc.). He believes it is his way of repaying Kaoru with allowing him to stay at her dojo. (although it seems he has gotten attracted to kaoru in the end). However, his swordsmanship ranks among the elite as he is seen defeating every rival (with the exception of Hajime Saitou which ended in a draw). His battle senses are top-notch and he recognizes even the slightest of advantages, strategies and tactics during a sword battle.